First, you'll need to refer back to the payment method you've added to the Viralstyle Fulfillment app. Have you added Credit/Debit or PayPal? You'll need set up (or confirm) a billing agreement with your PayPal account manager or support team before we can accept this payment method. This is required for all Viralstyle Fulfillment accounts using PayPal, their team will help you get the information for the verified payment source set up. See "Update Payment" below for instructions on where to add the PayPal Billing Agreement. In some cases your payment has cleared but does not reflect in the orders status because of inactivity. Please hard-refresh your browser to see if the payment has cleared just to be sure. If you see no change in payment status after refreshing, you may need to update your payment method. After you have made an the update, Viralstyle Fulfillment will automatically process the payment and continue with production. If you are still seeing "Payment Required" you may want to check the balance in that account, then compare the cost of production & shipping on the order(s) in question. 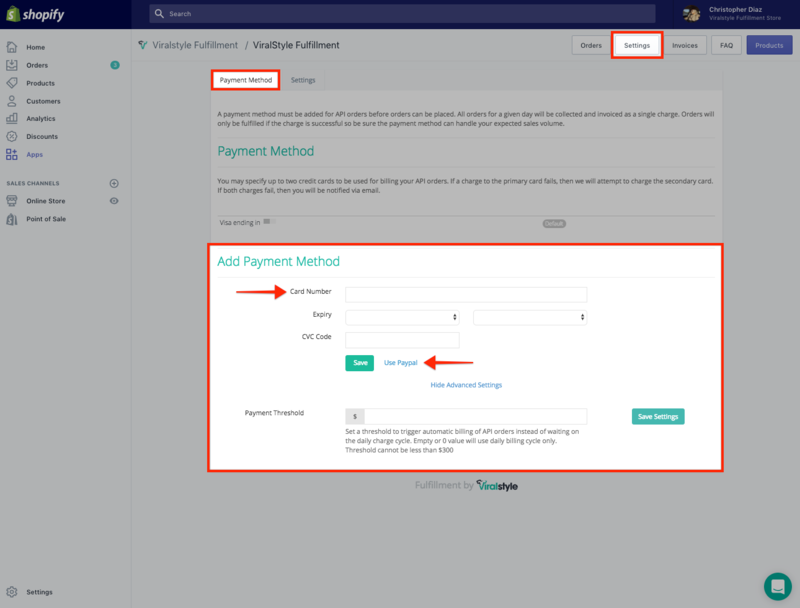 Set a threshold to trigger automatic billing of API orders instead of waiting on the daily charge cycle. Empty or 0 value will use daily billing cycle only. Threshold cannot be less than $300. You will not be able to use both PayPal & Credit/Debit for payment methods. Once you have selected PayPal and added the billing agreement, you can only use PayPal as a payment option. If you want to go back to cc/debit then you will have to cancel the PayPal billing agreement, then add a cc/debit card. The "additional payment" option is only available if you are using a cc/debit as the payment source. You can then add another cc/debit as a back up. Adding either of these payment options (PayPal & cc/debit) while the other is already in place, will remove the previous payment option. The most recent payment option added will be the default payment method. • A billing agreement is required to charge API orders via PayPal. Clicking continue will redirect you to the PayPal website to complete the agreement setup. You will be returned to the app once the agreement is completed. • You may also need to reach out to your bank and authorize 3rd party vendors (Viralstyle Fulfillment) to use the card with a recurring clearance. If you have any other questions we're happy to help!